I havn’t had all the time in the world to actually sit down and write out a blog post. Between work, hobbies, and my social life, a bunch of things fell though the cracks: blog writing, writing prose, finishing up a few books, and photography. As the semester is on the backswing, things are calm now, but will be back at full speed soon. Having a single class to focus on is making my academic life easier – I have the time to dedicate to class, and if I blow off a night of studying, it won’t kill my grade. Also, being a programming class, I don’t have to buy a bunch of parts (out of pocket, mind you), but just have to lug around a laptop (boy is the Air heavy… not) and type away. Backtracking a bit, almost exactly a year after getting hired full-time, we moved to a new office location. Last fall semester, we were told that we were going to move, but weren’t given exact dates. The building we were in was due to undergo renovations, and everybody had to be kicked out so this could happen. Some will be temporary, like the English and Foreign Languages departments, and other permanent, like our department (ITS). Also, Parking Services needed another lot, so they offered to buy us a new building in exchange for our old network trailers. We gladly accepted, as it meant a new building to replace the sad old ones, and a place for us hardware guys and the ladies in telecom to go. I finally got a door. And a window. It might be sad to be excited about such things, but a year in a stuffy basement with no privacy at all makes you appreciate the ability to know if it is raining and create a quiet environment to do work. Every so often, the office will have a BBQ to give us all an opportunity to get together, take a break, and relax. It usually happens after a big project or when the idea of one starts to rumble. Just after the summer, the new dorms had been finished and students moved in. There was a short lull in work, so a BBQ happened. Seeing our boss in the parking lot, on a trailer attached to his truck, on the phone and flipping burgers was one of the more interesting things that happened at this BBQ. Upon that, this was the first one we had at the new location, and will definitely not be the last. 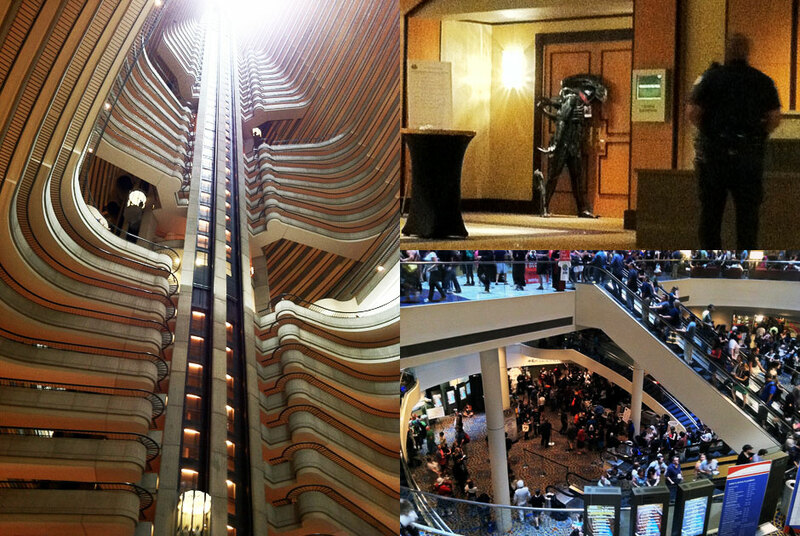 Dragon*Con this years was a hoot. Having gone to it last year, I learned what to do, what not to do, what to bring, and many of the unwritten rules of D*C. I got to see more panels this year, enjoy it longer, and was not as sick as I was last year. A splitting headache dulled out last year and made everything generally unpleasant. This year, for about a day, I had a runny nose and a sore throat. My better half caught the crud as well, but she did’t get better and missed out on a few things she wanted to do. Here’s to next year and trying to not get sick. Again. One thing I enjoy about Dragon*Con is the fact that downtown Atlanta becomes nerd paradise: anime characters walking up and down the street, superheroes hanging out in bars, and stormtroopers dancing at parties. The businesses in Downtown Atlanta have adapted to the sudden influx of several hundred thousand people converging onto a few square blocks. It’s a disorganized mess and quite possibly a massive fire hazard. One of the most visually stunning hotels, the Mariott Marquis, has some of the worst traffic issues in its lobby. It houses several very large panels, vendors, and essentially acts as the main lobby to take pictures of the fifteenth Batman you’ve seen at the convention. People waiting in line to wait in line, taking pictures of other con-goers, or getting awestruck with the awesome architecture of the lobby, often clog up walkways and make it difficult to navigate. Not to mention, it’s impossible to get an elevator in that hotel. 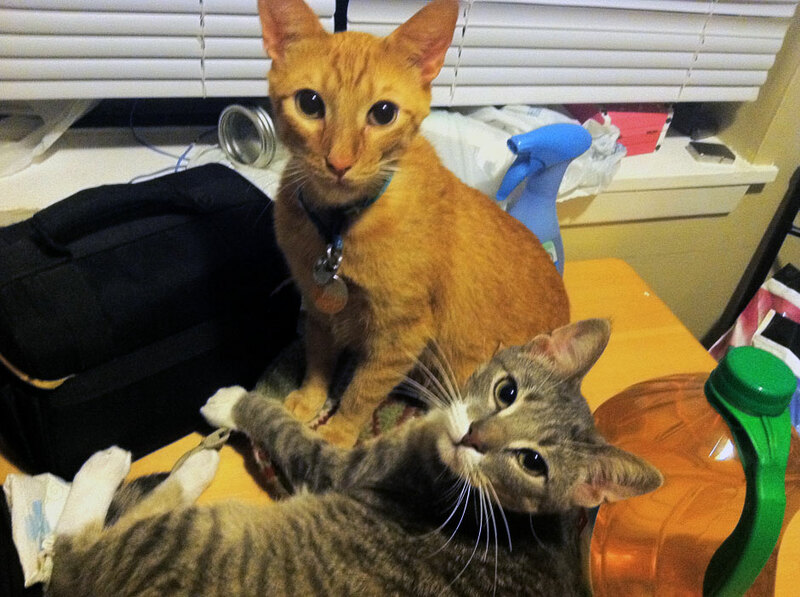 Those of you who care or keep track of my cats, they’re doing well. Socks is starting to calm down and play less with things he shouldn’t. Cat is slowly gaining enough confidence to be vocal about his needs. I’m most glad to announce is that both Cat and Socks are getting along very well with each other. Their spats are less spiteful and more playful, Cat has learned not to be as vocal about it, and more often than not, they’re in a pile sleeping or grooming each other. I’ve been focusing more on amateur radio lately. W5YD and MARC have had reciprocal non-voting memberships for quite a while now, but only recently have I been showing up tot he MARC meetings. We worked together in the past on various activities, including Field Day and emergency coordination. This year marks the shift from the more leisurely activities to more emergency operations for me. Field day, I contributed to a good portion of the points earned via digital. I also dabbled in to SSB phone for the first time. I learned a bit more about radiograms, and more about the equipment beyond what button do I press to talk. Two weekends ago, MFJ was celebrating its 40th Anniversary and hosted the ARRL Day in the Park. We had a few operators running the K5MFJ stations on various frequencies. Icom brought radios that ran every station, and boy, were they nice radios. My favorite one of the entire weekend was the IC-7700. It was probably more radio than necessary, but the beautiful screen, spectrum analyzer, and built in functions meant it was just an enjoyable experience. While I was promised digital for the weekend, that never happened, and I was kinda forced into doing SSB phone. I quickly got over it as the contacts rolled in, and I was transmitting for a good majority of the weekend. It was fun to be on the other end of the station everybody wanted to check into and to be told that I’m on a live stream of the event, at which I look straight into the camera, then continue on operating. So, the weekend prompted me to really go ahead and get my go-box rolling down the hill. We had talked about getting a few operators that will be in the area for a while that would be available at almost a drop of a hat. I said I would volunteer as soon as my “go-box” was ready, and another W5YD member volunteered to be the Red Cross contact for now. The Starkville area has two emergency management organizations that typically handles emergencies in the area – the Red Cross and OServs. Both also needed radio operators. So my goal is to hopefully be ready by next summer. I recently purchased probably the most expensive part of my “go-box,” the radio. I bought an Icom IC-736 second-hand online. It has a built in power supply and tuner, and can output 100W on 6m – 160m. The only downside to this radio is the fact that it runs on AC, meaning any portable power source I get for it has to offer AC. My plan is to get a temporary battery pack for fast deployment for a short period until stable power can be set up for now, and later springing for a more expensive Yamaha generator. I’ve got to settle on and decide on what antenna I’m going to get for the “go-box.” My apartment isn’t in the most ideal location, so I can’t use the same kinds of antennae I would in my emergency kit due to space and safety restrictions, and the antenna I get for the kit has to be quickly and easily put up without relying on much more than what I bring. This leaves me with either a vertical solution, or an inverted v. I can’t rely on trees, as a field won’t have one, and I can’t use one that can’t be stowed away in a trunk of a car. Fall has arrived, and it will only be a short few weeks before Winter takes over. The end of October means another round of social gatherings before, essentially, the end of the semester. It won’t be long before Christmas decorations will skip Thanksgiving, and then the end of the world on the 21st (if the Mayan myth is to be believed), and then the end of 2012. Boy did the year go by quick.